Fifteen members of the Spinzilla Cloth Roads Team Warmis Phuskadoras met in the shade of the church tower in Huancarani on Wednesday for a spin in. They wanted to compare their spinning speed with each other. As they arrived Team Captain, Doña Máxima, measured their waist and pollera (skirt) length for this year’s prize which will be a petticoat. Among the last to arrive was Doña Máxima´s sister Doña Narciza who had slowly made her way from home with her herd of goats. 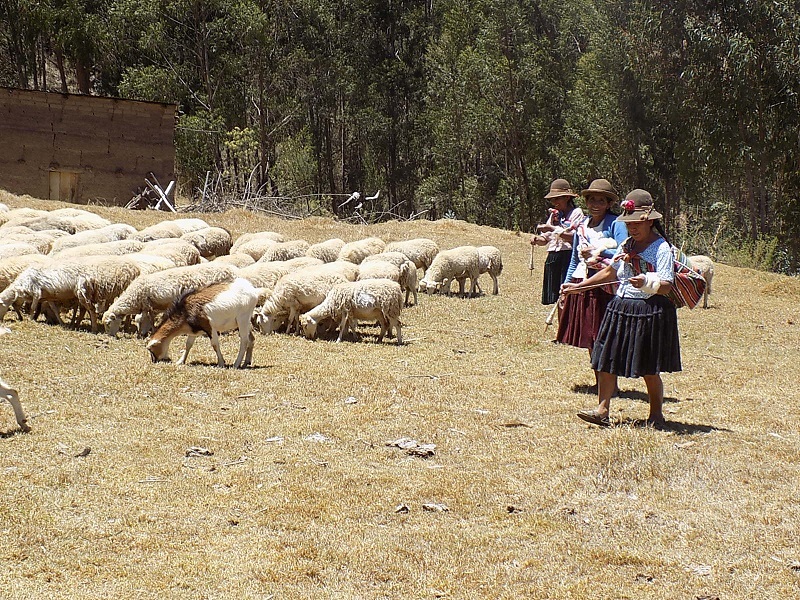 The drought in Bolivia continues and the search for grass while pasturing livestock is getting harder and harder. Each spinner reported how many phuskas (drop spindles) they had filled by this Day #3 of Spinzilla Spinning Week. Doña Justina was way in the lead with 12 filled, Doña Eulogia had completed 9, and everybody else had filled between 2 and 5. However, using the measurement of a “filled” phuska may be misleading as to how many yards it will measure in the end. 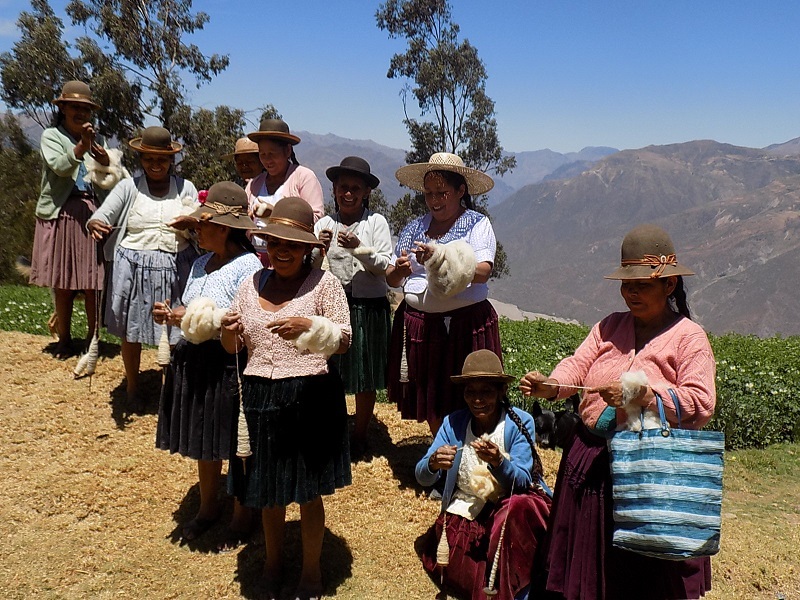 The women will wind the yarn from 2 phuskas together into the balls of yarn they present for measuring on Monday. That will be quickly done by placing a phuska between the big toe and the next toe of each foot and winding the 2 strands of yarn together into a ball. A few of the women said they were behind due to their attendance at community meetings on Monday and Tuesday. There will be another meeting on Friday in regards to the completed potable water project that supplied each house with a water spigot. The new water spigot beside the church was festooned with streamers and flowers due to its inauguration ceremony. It came in handy before and after the potluck lunch where all used their hands to dip into the bowls of boiled corn with cheese and sheep jerky and macaroni with scrambled eggs. One of the spinners announced a meeting coming up Saturday night for market vendors in Independencia, which many of them are and so must attend. The suggestion was made that they can spin at meetings and so they should continue to spin through Sunday regardless of where they are. All the spinners except Doña Eulogia were spinning white fleece. She was spinning brown. 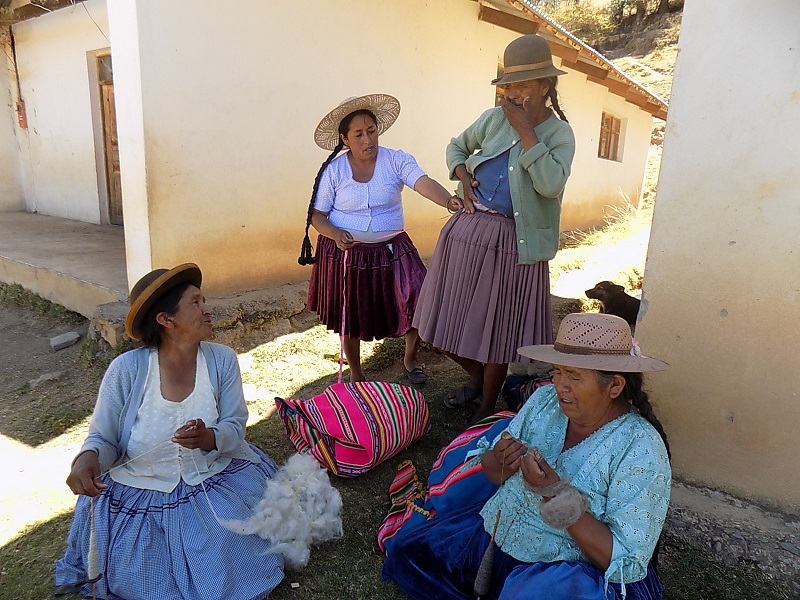 Only Doña Antonia who arrived with her flock of sheep was using fleece from her flock. 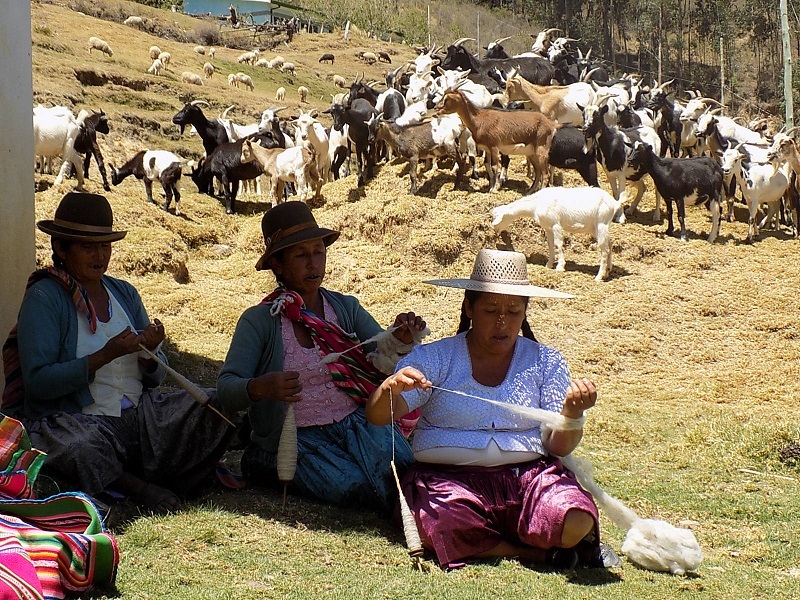 The majority of the spinners had purchased their fleece from a butcher in Independencia. Many of the spinners pasture their sheep at a lower elevation and the spines of the vegetation ruin the fleece for spinning. Doña Alicia complained that the fleece of her sheep is like goat fiber. 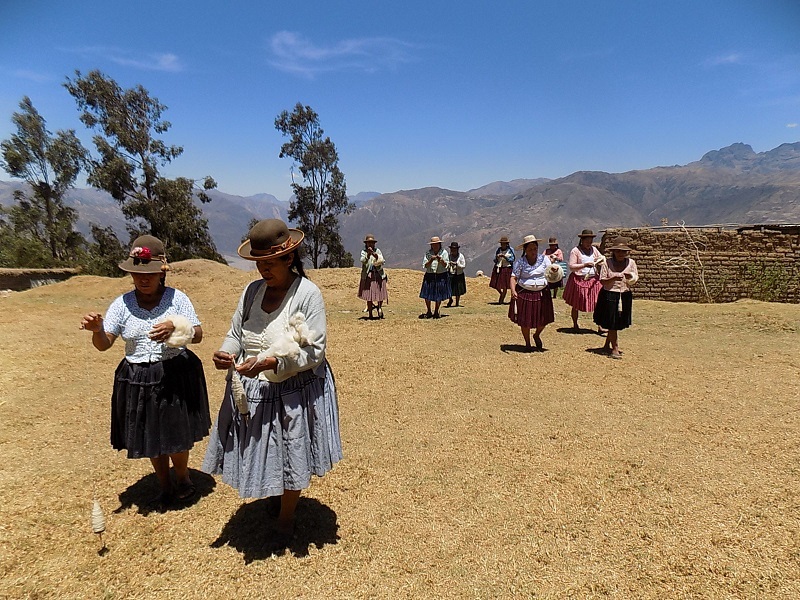 Vertical agriculture is practiced in this Andean area. At the lowest altitude along the river the farmers grow citrus, tomatoes, peanuts, and produce to sell. Midway up the mountain which is where the school, soccer field and church are located the grains and cereals are raised. Continuing up the mountain and above the tree line the many varieties of tubulars are grown. It is interesting to pass so quickly, well when walking downhill, from one ecosystem to another. Doña Eulalia was nowhere to be found, so she had probably made the trek down to work on her farm by the river. Just great. You are certainly doing a great job of keeping us informed. I’ll post on FB.